Jewish Voice for Peace was started in 1996 in the San Francisco Bay Area by three UC Berkeley undergrads as an all-volunteer Israel and Palestine peace group. In 2002, members decided to build a larger grassroots base that could one day change US policies towards the region. Funds were raised then, as now, through a grassroots campaign focused mostly on small individual donors. Today, JVP is a national organization closely connected to a growing grassroots base. We have 200,000 supporters on our email list, 10,000 individual donors, over 60 chapters across the United States, a staff of 28; a Rabbinic Council; an Artists’ Council; an Academic Advisory Council; a Health Council; a youth wing; and an Advisory Board consisting of some of the best-known Jewish thinkers of our time. JVP is a community of people dedicated to supporting and leading winnable campaigns to change US policy, shift US discourse, and even the playing field in order to create the political conditions that will allow Israelis and Palestinians to achieve a just and lasting peace. 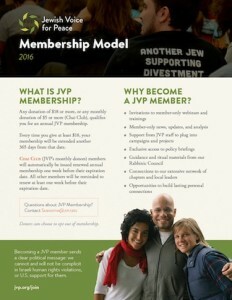 Why is it important that JVP is a Jewish group? We represent a growing portion of Jewish Americans. Israel claims to be acting in the name of the Jewish people, so we are compelled to make sure the world knows that many Jews are opposed to their actions. There are often attempts to silence critics of Israel by conflating legitimate criticism with anti-Semitism. Israel is a state, not a person. Everyone has the right to criticize the unjust actions of a state. How is JVP different from other major Jewish American peace groups? Unlike other groups, we support full equality for Palestinians and Jewish Israelis grounded in international law and universal principles of human rights, and we have a large grassroots base of members across the country who lead or work on campaigns. Because we believe in concrete action, and not just words, JVP was the first major Jewish peace group to demand that American military aid be withheld until Israel ends its occupation. We also are the only major Jewish group to support the Palestinian civil society call for boycott, divestment and sanctions. What’s JVP’s position: one-state or two? We support any solution that is consistent with the full rights of both Palestinians and Israeli Jews, whether one binational state, two states, or some other solution. It is up to Israelis and Palestinians to reach a mutually agreed upon solution. However, we also believe it is our obligation to offer honest analysis about the diminishing likelihood of a two-state solution given decades of Israeli settlement expansion and the current Israeli leadership’s open resolve to block the creation of a Palestinian state. What is your position regarding Palestinian refugees? JVP supports the Universal Declaration of Human Rights, including the right of people to return to their countries. Peace will only be possible when Israel acknowledges the Palestinian refugees’ right of return and negotiates a mutually agreed, just solution based on principles established in international law including return, compensation and/or resettlement. For more information, view JVP’s Nakba Education Project. Do you support boycott, divestment and sanctions? JVP proudly endorses the Palestinian civil society call for boycott, divestment and sanctions (BDS) until Israel abides by international law. We reject the assertion that BDS is inherently anti-Semitic and defend activists who employ the full range of BDS tactics when they are demonized or wrongly accused of anti-Semitism. We believe BDS is a meaningful alternative to passivity engendered by two decades of failed peace talks, and is the most effective grassroots means for applying nonviolent pressure to change Israeli policies. Read JVP’s full statement on BDS. Any donation of $18 or more, or any monthly donation of $5 or more (Chai Club), qualifies you for an annual JVP membership. JVP members endorse JVP’s mission and guiding principles. Note: donors can choose to opt out of membership. Every time you give at least $18, your membership will be extended another 365 days from that date. Chai Club (JVP’s monthly donors) members will automatically be issued renewed annual membership one week before their expiration date. All other members will be reminded to renew at least one week before their expiration date.